Reviewed by Savasia J. Vida at the Santa Barbara Film Festival, 2018. The Public invites the clash between the authority and the homeless that highlights the intensity and quick solutions made to de-escalate the crisis of overpopulated public housing. Located in downtown Cincinnati, the public library is seen as a safe space for the homeless to educate themselves, use the bathroom/clean and even sleep. One of the librarians, Stuart Goodson, has a rather personal relationship with a couple homeless guys as they persuade him to use the public library for a night of public housing due to the piercing and deathly cold weather reports that have killed several homeless people in the area. The occupation of the public library is seen a good strategy for the homeless, but the police and media outlets beg to differ. As they surround the library, they claim how the building is used as a “hostile situation”, where the homeless are seen as a threat to the outside world. As a former homeless man, Stuart empathizes with his peers; he even videotapes the conditions within the library as they enjoy themselves by playing board games, reading and eating pizza. But as the night goes on, the intensity between the authority and the homeless increases as Stuart must come up with a plan to let everyone go without being prosecuted for wanting to stay in a warm place. The Public‘s theme is thought-provoking as it addresses the perspective of the homeless population trying to survive is cold weather conditions. Not only does this film illuminate the various perspectives the population goes through, I left the theater with an open-mind of how the simple things the rest of us have are taken for granted. I do want to address the heavy presence of homeless men in the film: I feel that the exclusion of homeless women within this occupation doesn’t fully encompass the experience of the homeless. If anything, homeless women have more health needs to attend to that could’ve highlighted additional complex notions to the plot. I really enjoyed your review! I agree that The Public was a very interesting, well-done social commentary. It addressed the problem of authority and the struggle of the homeless people in an amusing way that also pointed out the importance of making a change and standing up for your rights. I liked how you mentioned how it was mostly men. I find that interesting and would like to know a little more about why- maybe women and children are given first pick of homeless shelter so the men are the ones left? Or maybe there are moe women’s shelters around to provide protection? Interesting point that definitely is missing from the plot. This sounds like an incredible movie. Although the plot seems saddening it’s a very good lesson and information for people to learn. There are so many people that are homeless in modern day and they don’t get enough help and many people aren’t educated on what they have to go through. I love that you also highlighted the fact that women should have played a role in the film. Because, there are men, women, and children that are homeless and all of them should be getting equal awareness and help. I would watch this movie, and advise others to do the same because it seems it will give off a very impactful message. I like the storytelling of this film it is very educational, and it is one of those movies that can have a meaningful impact on viewers. Since it brings awareness how as a society have two different opinions towards people who live in homelessness. The ones who want to help and the ones who have a negative view on this social problem. Also, this types of none narrative movies can change the future of the cinema industry and make more films that are more descriptive to reality where we live. Also, the title and setting of the movie have a strong implicit and explicit meaning. The fact that the movie is called “The Public” and it takes place in a library gives a lot of contradiction about public spaces. I’m looking forward to seeing this movie! I liked your review a lot and I think this is a very interesting movie to see. Today, we can see that problem and still very homeless with no much help. I think is good when we can see films and they are related of our every days lives. The movie, as the review say, just make reference about men, but I think it should also mention the women, we can see that in every day life. This kind of movies are educational and everybody should see, maybe should be also good to show in schools. I am definitely going to see the movie. This film looks very interesting it seems to be, by what I read in your review that it is a film that is about social problems that many of us may not be aware of. For example, the social problem of so many people being homeless and there not being any help and how us as a society may act around them. This many be a hard film to watch because of the fact that at times we are unaware that many people have it harder and that is why this film sounds so great because it seems to address a actual problem in our society and how homeless get treated. This film seems very interesting and I really enjoyed your review. It was very direct and explained the plot of the film very well. It was detailed and made the film and the whole plot line seem very interesting. Homelessness is a big issue and even worse in states with colder weather. Being from Detroit, I can totally relate to this and the situation that these people are faced in. Our library was a safe place for the homeless similarly to the film. I liked how you gave your own opinion at the end of your review. Hopefully “The Public” will be able to bring more awareness of the conditions homeless people face. You did a great job on the film review and I found it very interesting. This review has made me want to watch the film in my free time. The title was a great choice for this film as it explains the explicit meaning of the film. Homelessness is sadly still such a huge problem today in the world we live in. The film is very eyeopening and shows the two different lives that people live; those in society who have a roof over their heads and those who are among the homeless population with nowhere to go. It is shown how our society reacts to the homeless population and how some are willing to help them while others want nothing to do with making an impact. This was a very good review. This film seems like it would be incredibly close to home, interesting, and heart warming. Although the plot seems like it would be a little bit sad, it covers such a relevant problem in our society. There are many homeless people out on the streets with no where to sleep, no bathrooms to use, and no shelter from any natural disasters or even just weather conditions in general. For the librarian to take these homeless people in and give them a place to stay for even just a little while, is truly amazing. It seems like the librarian would be a very moving and incredibly kind character in this movie. This film seems like it would be truly great and I actually hope to someday watch it. After reading this review, I would want to watch the movie. They did a great job of giving a summary of what the movie The Public was about. The plot itself sounds very interesting. This review put into perspective of what homeless people have to go through and how they are human beings too. Just because they don’t have a place to life, doesn’t mean they shouldn’t be able to use PUBLIC resources. It is very eye opening and unfortunate the conditions that they go under with the freezing cold. I don’t understand why authority would get annoyed if they aren’t causing any harm to anyone. They clearly aren’t bothering anyone if a librarian has built a relationship with them. Overall, this film review has already made me very invested in this film without even watching it. I really liked this review and although i have not watched this film i felt engaged while reading the review. This review shows the daily struggles homeless people go through all over the country but especially in the colder parts of the country. Here in santa barbara it is cold for a little bit because we basically live in perfect weather so the homeless can manage to sleep outside but homeless in those colder areas have to find a way to find a warm area to sleep to survive. This review made me open my mind a lot more about the homeless that actually want to do good and no just standing around asking for money. Very good review. I love the entire plot and story line of the movie. This film sounds like something that would be worth watching to the public at large. This is realism at its finest. I think the story of the homeless is one that is under told in this country. Many people in the general public either hate or are afraid of homeless people. They share these opinions of them because they don’t know them. Emilio Estevez plays a great character, but since his character was once homeless he empathizes with them. Great review and sounds like a great movie. I really enjoyed your review because it made me want to go out and watch the film just from how you described it. It sounds different than most of the hollywood films. I could really tell that the film meant something to you just from the way you talk about it. Its a difficult issue that many people don’t know how to approach. This film seems like a good way to bring awareness for a certain issue. After reading your review it made me very interested in watching the film. This film helps to bring attention to a touchy yet important problem that we still have in our country today which is homelessness. The film includes what goes on in our society today as some people are homeless while others have a roof over their heads. Sadly having a home is not something that everyone has. Based on your review I am able to understand that the film shows the daily struggles that homeless people go through. It is so eyeopening to see how some people react and treat homeless people and are so unwilling to help them. People act as if homeless people are not human but I think everyone deserves to be treated with respect. I hope that this film makes a change and changes peoples thoughts on homeless people. I really enjoyed your review on “The Public” and thought that it covered the severity of the matter very well. According to your review the film seems eye opening to people who are fortunate enough to have warmth and shelter on a daily basis. Some people judge homeless people and don’t care to help because they are making assumptions about the person. What people don’t realize is sometimes it’s not always that persons fault. People can be kicked out on the street for multiple reasons and sometimes have no body to call for help. This film seems like a great way to bring awareness to the issue. I can’t wait to watch this film. One of my favorite quotes in this movie: “The people you are protecting, is it worth throwing your life away”, really sums up this movie. For me this movie really hits home, as a former military member, I have seen several countries that have homeless beyond what you could imagine. These people freeze to death, have kids who they are raising (while homeless) and some of them are crippled or crawling around on a box with wheels due to being paralyzed. Even in Santa Barbara, we see the homeless on state street rising very quickly. This movie leaves you thinking about all the things wrong with our country, beyond just the homeless population issues. I really liked your review, I had just recently seen this movie, and I agree with your short article. I love with your statement about leaving the theater open-minded because I completely agree, we take so many things for granted. Yes we work for what we have, by why should we turn a blind eye to the people who are less fortunate than we are, whatever the reason. Although there are tons of debates, and reasons why people say giving money to the homeless on the corner are a bad idea, I disagree, if I am enabling 9 people, I hope that the last 1 person gets a decent meal for his night on the streets. Great review! Your film review is one of the best I’ve read on this page and has persuaded me to add this to the list of films I will have to watch in the near future. The homeless problem is a very interesting and controversial one. Being a New York City native the issue of homeless shelters and public housing has been one that is embedded within every neighborhood due to the population of homeless people that live in New York City. The majority of the population in new york city are infuriated when a homeless shelter is brought up in their neighborhood which is not very humane in my opinion. I am intrigued in the films approach on the matter. It seems as though the director will make the viewer empathize with the homeless. Very interesting review and I lok to reading more work from you. This review that I will be reading is on the film The Public. I have never seen this film but the way that this person wrote this review is making thing film sound very interesting and everything that I’ve heard in the review makes me want to watch this film. I love how Savasia J. mentioned all the great details that were in the movie. I also like how she went into such great detail but with such little of words, from this review just because of all the detail and how specific she went into detail I feel like I could see myself watching this film. This review intrigues me to watch this film. I liked how you simply stated that the theme was how most of us take the simple things in life for granted. Most people don’t think about the less fortunate during the winter times and it sounds like this film accurately portrays the struggles homeless people face during the winter months. I liked how they noticed that women were not given enough representation in the film. Typically, women require more needs and it would have been important to include them in the film. Overall, this review gave a good insight about what to expect when watching this film. I liked your review on The Public and how you were able to give a description of the film without giving away spoilers that may discourage other people who haven’t seen the film. I also like that you included that you would have liked to see the portrayal of more homeless woman on screen which would add additional complex notions to the plot. I would have wanted a little more information about the film in regards to maybe cinematography, music, or acting. You do a fantastic job explaining the plot but give little to other categories. Overall this was an informative review and I can’t wait to see the film myself. I had never heard of this relatively new film and was really persuaded to watch it after reading this film review. I’ve never watched a film that discussed homelessness and the issues the homeless face, and I think it’s really important for industries like film to do what they can to bring attention to these issues. This sounds like a really thought provoking and interesting movie, and I really want to watch it outside of class. This film seems to touch on really relevant and important social issues, strengthening it’s overall message. This film review addressed the fact that this movie would have been more powerful and accurate had it included homeless women, which I will keep in mind when I watch this film. Great film review! This film opened the 2018 Santa Barbara International Film Festival and was very well received. 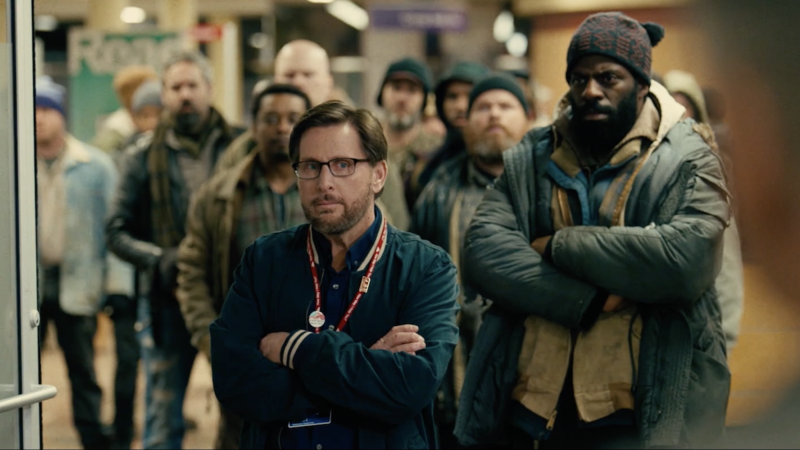 Your review helps readers understand what writer/ director Emilio Estevez was trying to achieve in this very personal look at the increasing homeless problem across this country and around the world. The story is realistic and focuses on the way the homeless consider themselves and their plight. The library setting was chosen because, by law, the library must be open to the entire public. Your review reminds us that where there is comfort for some, it offers great discomfort to many others. The acting was natural and very convincing throughout the entire film, EXCEPT the teeth brushing scene early in the film. I am not an authority on the dental hygiene of the homeless, but they were all committed, surprisingly, to a very good brushing. I had the pleasure to attend a screening of The Public at the festival and Mr. Estevez is very passionate about his commitment to bring serious attention to this uncomfortable, unfortunate state in our country. Interesting enough I was forced to watch this film three weeks ago. I’m working for an organization called LA Family Housing for the summer, and one of the outside the box things they make us do is watch this movie so that we have compassion for homeless people and realize that they’re just like us. Your review is spot on. This was a very emotional film for me to watch. This film is realism at its best. I had never thought about the extreme duress that the homeless go through over their living situation in the winter before I watched this movie. I think anybody who works with the homeless should watch this movie to give them some perspective because this movie really does humanize homeless people. Excellent review. I have not watched this movie but after i read this review it make interested to actually watched the movie. As a student I see this issue over and over again but I do not see any change. The films plot is very important to the audience because is an issue that has to taken care of. Also in the review it shows that the compassion of one of the librarian will risk everything to protect the homeless in need.